Many breeders have said that the first Russian Blue cats originated from the Baltic port of Archangel, near the Arctic Circle, and were carried as trade goods by merchant sailors on ships trading with England. The cats were shown extensively in England during the latter part of the 19th century, yet despite being a distinctly different breed they were shown together with other blue shorthairs under various collective titles such as the Foreign Blue and the Archangel. When the cats were shown for the first time, all shorthaired blue cats competed in the one class, regardless of their type. The Russian Blue, in 1912, was given its own class, but during World War II the breed almost became extinct, being saved only by the outcrossing to Siamese. 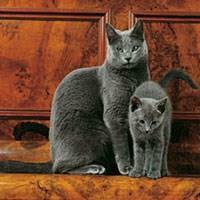 Eventually breeders made a co-ordinated attempt to return to the pre-war characteristics of the breed, and in 1965 the show standard was changed to state specifically that the Siamese-type cat was undesirable in the Russian Blue. Today, the regal Russian Blue Cat with its elegant coat, sparkling green eyes and stately manner has long been associated with royalty and was particularly coveted by the Tsars and the aristocracy. The beautiful Russian Blue has a deservedly haughty air, but is blessed with a gentle soul. The Australian Russian Blue is bred to standards very similar to that in the UK, but differs greatly to the style of Russian Blue cats bred in America. The Russian Blue has a double coat which is very different from any other breed - it is short, thick and very fine and its density causes the double-textured coat to stand out from the body. Its clear blue colour gives the cat an overall lustrous silvery sheen that only adds to its regal look. This powerful and elegant cat is not a cat of extremes – making it a very appealing pet to have in the home. It will get along with all of the members of the household, be they people or other animals, providing it is treated with the respect it deserves.